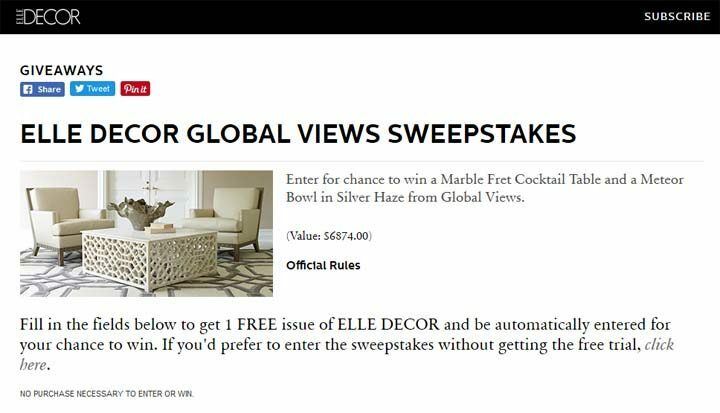 The ELLE Decor Global Views Sweepstakes is open to legal residents of the 50 United States, the District of Columbia and Canada (excluding Quebec) who have reached the age of 18 or older. The ELLE Decor Global Views Sweepstakes ends on July 31 at 11:59 P.M. (ET). To enter, go to globalviews.elledecor.com to complete the entry form. Limit one (1) entry per person. One (1) Winner will receive the Marble Fret Cocktail Table from Global Views, ARV $5,749 and one large size Meteor Bowl in Silver Haze from Global Views, ARV $1,125.